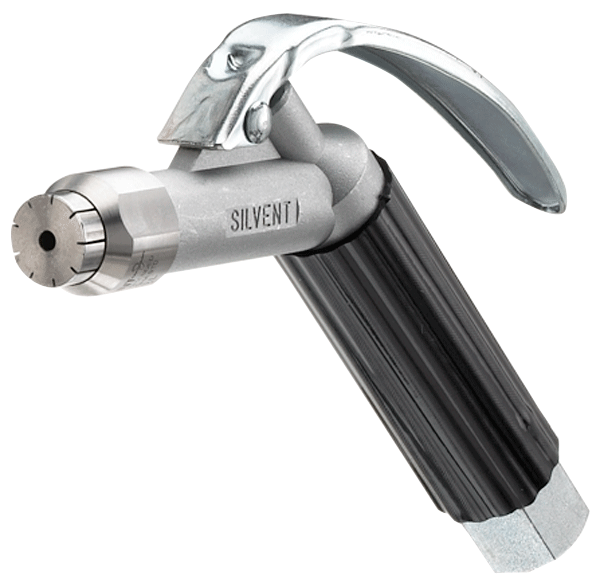 SILVENT 755-L: with a stainless steel Laval nozzle. A core stream traveling at supersonic speed surrounded by a protective sheath of air moving parallel to the central jet makes optimal use of your compressed air. Around the Laval orifice there are divergent slots that generate a quiet, powerful and laminar air stream. The blowing force is approximately 5 times that of an ordinary air gun. Despite the high blowing force, both the noise level and air consumption are low. This safety air gun is frequently used in the glass industry, paper mills, foundries, steel mills etc. The safety guns of the 750 series have up to 12 times stronger blowing force than ordinary air guns on the market today. Despite the high blowing force, both the sound level and energy consumption are low. The 750 grip has been developed for jobs requiring high blowing power and working environments that demand a robust grip and valve construction. These guns can also be used when wearing work gloves and the grip is considerably more impact resistant than conventional guns. Commonly used in glass works, paper mills, foundries, steel mills, etc. Thumb regulation is standard on the pistol handle to provide the most ergonomic grip. If desired, the handle can also be fitted with an extended trigger for hand regulation.